I saw this recipe online the other day for Blueberry Oatmeal Muffins and I knew at once I had to make these. After all what says good morning like a blueberry muffin? These muffins were super easy to make and literally took no time at all. For the most part I followed the recipe exactly with 2 exceptions. First, I didn’t have and canola oil which the original recipe called for. So I got to thinking what could I use in its place, then it hit me… Coconut Oil. The Coconut oil added just hint of coconut flavor, which went well with the oatmeal and blueberries. Plus coconut oil is good extremely good for you. The second addition I made to this recipe was I added just a teaspoon of vanilla extract. I’m not sure I could bake something and not add vanilla. All I can say is I’m thankful to Rhonda Sittig and The Thankful Heart for this great recipe! I hope y’all enjoy these as much as I do. Stir together the oatmeal, flour, baking powder, salt and brown sugar. Then in a separate bowl mix in the buttermilk, egg, vanilla and the coconut oil. Pour the wet ingredients directly into the dry, and stir until combined. 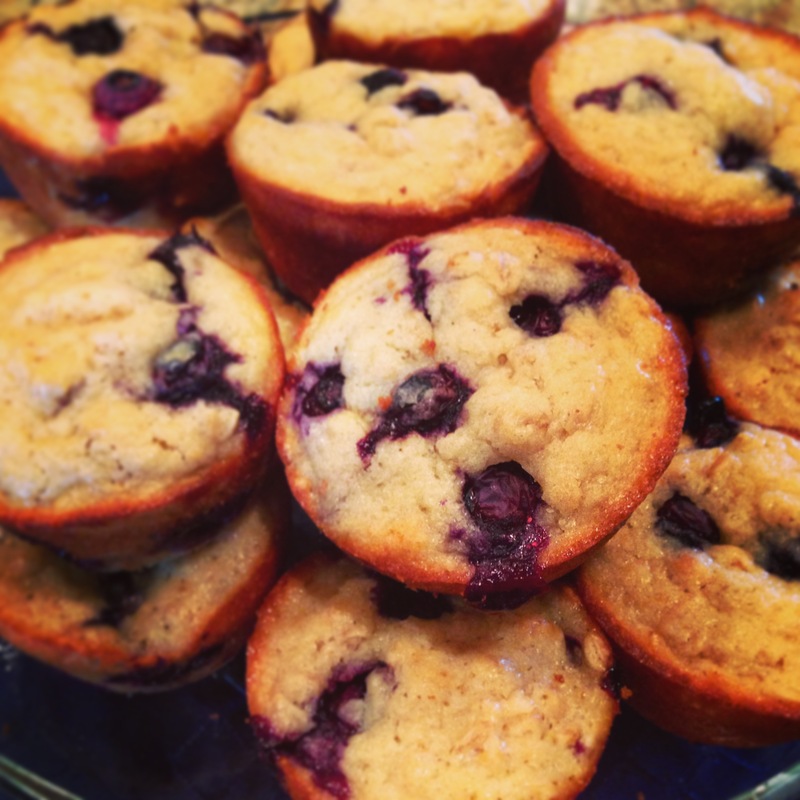 Lastly, toss the blueberries with a tablespoon of flour then fold them in to the batter. Spoon the batter into 12 muffin cups lined with paper liners. Bake at 375 for about 20 minutes until they are golden brown. ** Coconut oil is usually in a solid state if kept below 76 degrees. I measure out my oil then heat it for 20 seconds in the microwave until it’s a liquid. Also if you don’t like coconut oil you can use canola oil or even butter in its place. ** A spring-loaded ice cream scoop is the perfect for scooping batter into muffin/cupcake tins. Mom’s Chicken Enchilada Casserole and the Evolution of a Family Recipe…. yummy, these look delicious. can’t wait to try them!